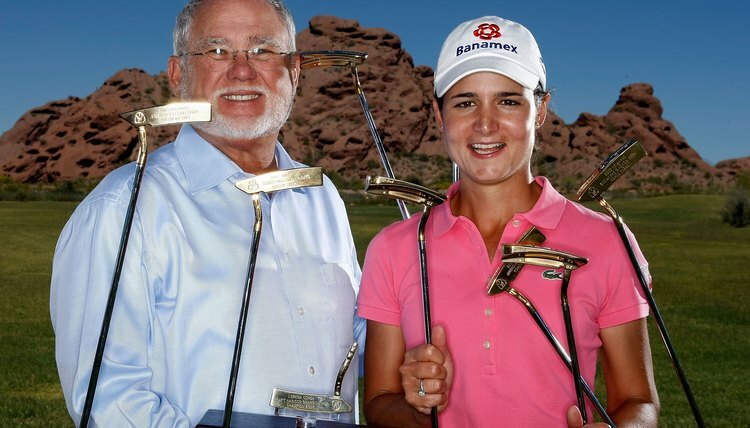 Ping President and CEO John Solheim presents nine gold putters to Lorena Ochoa in 2009 for her LPGA Tour victories the previous year. Golfing is not just about skills, it is about using the best equipment. This is why hundreds of golfers have relied on Ping Golf Co.’s line of clubs that all started with a putter over 50 years ago. Their innovative clubs have become an integral part of golf and are associated with some of the biggest wins in PGA golf history. Their long history shows why the club is successful and how it has developed throughout the years. Working out of his own garage, Karsten Solheim developed the first Ping putter in his own garage in 1959. That model was labeled the 1-A putter and featured weight that kept balance throughout the head of the club. The success of the putter was proven three years later when the Cajun Classic golf tournament was won by John Barnum as he used the putter. The Karsten Manufacturing Corp. was developing to further produce the landmark clubs. The 1970s saw the putters expand and the Anser line even developed drivers and iron clubs. A new tradition started with each winning putter becoming duplicated, labeled and sealed in a vault. The label was created using gold plaque material that can still be seen today at their headquarters. The success of the putters grew and the majority of putters used in the PGA and tournaments were Ping putters by the end of the 1970s. The 1987 PGA Championship helped put the new Anser2 putter on the map. Along with that putter, the PAL, PAL2 and ZING 2 were released during the 1980s. The putters' acclaim earned Karsten national recognition from Ronald Reagan. Reagan awarded him with the “E” award for his exportation of Ping putters because they have always been American made. The 1990s brought on some of the same success and new changes for the company. Karsten received tournaments dedicated in his name and the Ping putters were responsible for five tournament wins in a row in 1993. Business in the 1990s continued to thrive for Ping putters, and Kirsten’s son eventually took over the company as the putters were used to win over 1,400 golf tournaments, including over 40 major tournaments. Kirsten passed away in the early 2000s, but his legacy continued within the company he created. The World Golf Hall of Fame inducted him, and the Ping Craz-E putter saw huge success with its release in 2004. The putter quickly spread as one of the best and broke records as it was used to win over 2,200 tournaments. What Makes Scotty Cameron Putters Great? Was Hank Haney a PGA Player?